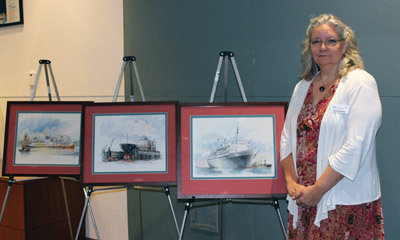 One of Europe’s most prominent maritime artists has donated 12 original watercolor paintings to the Tampa Bay Port Authority, all thanks to a friendship established more than a decade ago with a couple from Ruskin. Ronald van Rikxoort, renowned throughout Europe for his drawings and paintings, would likely never have heard of Tampa but for his friendship with David and Anne Madden. The couples met when David Madden was stationed with the U.S. Army in Holland in 1998. 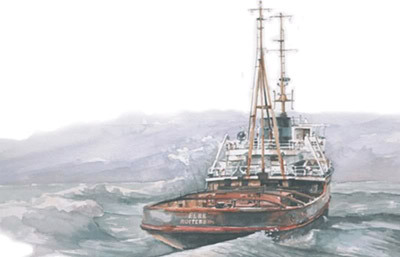 “Ronald taught a drawing class at the U.S. Military Community Education Center, and I took the class,” recalled Anne Madden who stood in for van Rikxoort and presented the artwork to the port. “He and his wife Emmy became friends, and we often socialized,” said Madden. Anne Madden had the pieces on display at her Ruskin art gallery, The Blue Ibis, which closed in 2005. Since then, they could be found at her Ruskin home. “We [van Rikxoort and Madden] talked and decided rather than sending the paintings back to him he would like to find a home for them here, and the Port of Tampa was a logical place,” Anne Madden said. Port officials couldn’t be happier about the donation arranged by Madden. “We are glad that everybody is so excited about the paintings and the fact that they were a gift to the port of Tampa,” said van Rikxoort in an email, joking that he would love an invitation from the Port Authority to see for himself how the pictures are displayed. 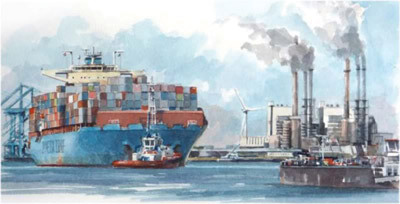 A graduate of the Art Academy in Maastricht, the Netherlands, van Rikxoort authored a book of paintings, Rotterdam, Harbor in Motion. Rotterdam, a Dutch port city, is one of the busiest ports in the world. All 12 paintings, along with a self-portrait of the artist, will be displayed as a collection in the Port Authority’s administration building, 1101 Channelside Drive in Tampa.